Kittens learn many skills they will need to survive as adults through play. 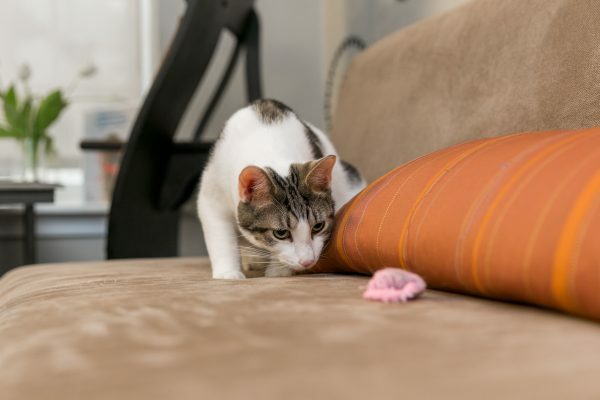 Games that involve pouncing, batting, and chasing provide kittens with a safe way to practice their natural predatory behaviors and develop tricks to catch prey. This playful behavior is seen as early as 3 weeks of age. For some cats this behavior may start to decline after 3-4 months of age, however many cats remain playful throughout their lives. Most cats are highly motivated to play, and may be attracted by any sudden movement. 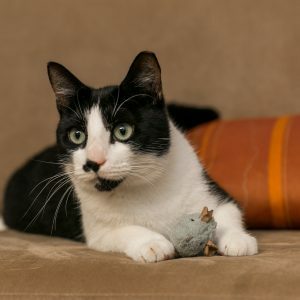 You can easily provide an outlet for your cat’s need to stalk and hunt by playing together using toys such as a feather wand, a pretend mouse, or a noisy ball designed for cats. Cats evolved as solitary hunters of small mammals and birds. Feral cats dedicate a large amount of their time hunting prey. They eat between 10 and 20 small meals throughout the day. The feline drive to hunt is highly developed and is separate from the drive to eat. A cat will stop eating a freshly-caught meal to chase after a second object of interest that happens to pass by. Unlike playful behavior, the hunting drive does not decrease with age in cats. Cats seem to prefer ambush tactics to catch their prey. They either sit next to the burrows of small mammals waiting for them to emerge, or they will quietly creep up and pounce on their prey. This approach not only increases their chance of success, it limits the overall energy expenditure chasing after a particular target. Humans domesticated cats almost 15,000 years ago for their keen ability to manage small rodent populations. This helped emerging agricultural civilizations protect their crops. By comparison, bringing cats into our homes as companions is a very recent development in the human-cat relationship. Although cats have adapted extremely well to their change of circumstances, they have maintained the instincts of their wild ancestors, including a strong drive to hunt. Today’s cats may be well-fed, but they still require an outlet for their need to hunt. They may develop physical or behavioral problems if they do not have an opportunity to do so. Some cats may suffer from boredom and obesity while others may actually show aggression towards their caregivers. For indoor cats, this need can be alleviated through play. If your cat’s stalking or hunting behaviors is causing a problem, please speak with your veterinarian for advice on how to appropriately manage this behavior.